See how to make a bow for your presents and gifts to give to loved ones, family and friends, ranging from simple but elegant, to more complex creations. I love picking out or making just the right present and then wrapping it up. 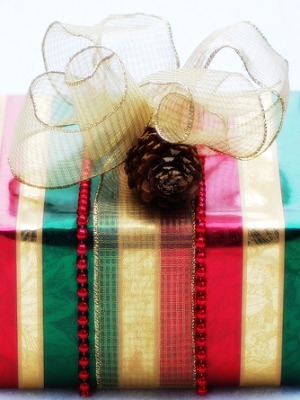 The finishing touch, of course, for any wrapped present is the perfect bow. You can use store bought bows, and trust me, I do on many occasions. There is nothing wrong with them. However, sometimes you may want to make your own bow, for an extra special present, or because you need a really large bow for an oversized present. No matter your reason, making your own gift bows can be more difficult than you think, or more simple than you imagine. Here are a range of videos I have found that show how to make festive curly bows, simple and elegant ribbon bows, and how to make big bows that are more intricate in design. Just because you make your own gift bows, and you use a simple technique, does not mean the result is not beautiful. Sometimes simple bows can be the best. This first video shows how to make a bow for your presents using curling ribbon. I personally think this is a good technique to use for kids presents. They really love the ribbon spirals that result when you run the curling ribbon down the length of your scissors. In addition, the video does not show it but you can add even more ribbon to the center and curl it, in all kinds of colors, to make a really festive package. Sometimes, instead of a festive look, you want a more elegant look for your gift. In that case I suggest using real ribbon, instead of plastic curling ribbon. The result, even with just a simple bow, is very beautiful. Below is a video showing how to make a bow with this simple method, including tips on how long to cut the ribbon so it is long enough to wrap around your package, but not so long so that you end up wasting ribbon. This last video shows a more complex technique for making bows. I have found that these types of videos are helpful, but you really need to practice making them a couple of times before your bows will look as good. Learning how to make these kinds of bows, and other similar techniques, can come in handy for more reasons that just wrapping gifts. These types of large bows can also be used for weddings or decorating other items around your home.